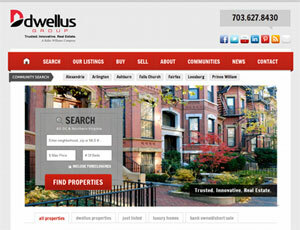 Our client spotlight this month is Ryan Zook of Dwellus.com, whose website for Washington, D.C. area real estate offers a fun approach to real estate sites along with some fresh ideas to using IDX search. Built with the help of the marketing firm Virtual Results, Dwellus.com features lots of ideas worth checking out for inspiration for your site. Sandwiched between his bright red nav bar and an oversized slideshow on his homepage, Ryan’s “Community Search” buttons are hard to miss. I like that visitors can see all the areas he serves at a glance — they’re not buried on a second page or hidden in a drop down menu. It’s important that visitors can tell that you serve the specific neighborhoods or communities that they’re interested in, particularly when you serve a market as extensive as the D.C. area. 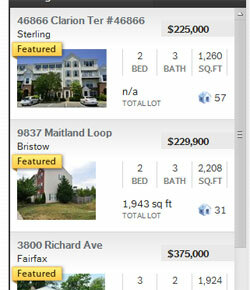 IDX search widgets work best when they offer visitors a clear, simple way to get to listings immediately. Forms with too many fields can look complicated and turn people off, but if your form is too brief, it can get lost on the page and overlooked. Ryan is using a stripped down Quick Search widget with only three input fields, but he gets user attention with monster-truck-sized search button and input boxes, and by positioning the widget on top of a slideshow of beautiful photos on his homepage. His IDX search widget is simple – but can’t be missed. Virtual Results built this custom search form for Dwellus.com. You won’t be able to get the exact same thing without extensive custom work, but you can get close by generating a Quick Search module from your dsSearchAgent IDX Control Panel. Only use the city, beds, and price search fields, then add some CSS to style it. I can put together a blog post detailing how to modify the look of our search modules using CSS if there’s enough demand. The shortcode feature of our IDX widget makes it easy to display snippets of property thumbnails on your site, but Ryan uses tabs to take it one step further. Instead of simply displaying a single list of his listings or new listings, he provides tabs that toggle between lists of “all properties”, “dwellus properties”, “just listed”, “luxury homes”, or “bank owned/short sales”. With tabbed shortcodes, Ryan provides visitors a glimpse of many different types of homes – without ever leaving the page and without taking up lots of room on the page. Used on his homepage and community pages, these “tabbed shortcodes” are a great combo that add a level of interactivity while allowing his site to showcase more listings. You can use the shortcode feature of our IDX plugin to embed a list of properties onto any page of your site. Used with a plugin like this one, you could setup your site to display different property shortcodes across a series of tabs. Similar to his community links, the “Explore Neighborhoods” section of his homepage provides one-click access to neighborhood info. With fun graphics and an alternate background to set it off from the rest of the page, it’s clean, eye-catching, and helps reinforce how hyperlocal their services are. Dwellus has some fun with their client testimonials, displaying a snippet of each in a big speech bubble above the client name. 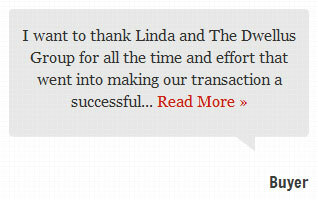 It’s a fun look that makes it easy to browse through lots of testimonials on a single page. I also like how they’ve labeled anonymous clients as either “buyer” or “seller” instead of the standard “anonymous” moniker. Helping lend credibility and establish trust, client testimonials are a vital part of any real estate web site, and it’s a nice surprise to find them displayed in creative ways like this. The “Search” button in the main nav bar loads our framed mapping IDX search — but with a few featured properties pre-loaded on the map. It’s a great way to highlight office listings or specific listings you are promoting and it shows off the mapping capabilities of his search right away. Pre-loading featured properties on your search page is an option you can set when you generate the mapping IDX script to your site. Just go to your IDX Dashboard, check the “Featured Properties” toggle to display either agent or office listings on load, then add the generated framing code to your site. If you’re not seeing the correct “featured” listings, contact us to make sure we have the right agent ID and office ID setup for your account. From the numbered checklist on his “Buy” page, to calls to action on his “Market Stats” page and helping pop outs on his “Contact” page, there’s a lot to love about this site. Be sure to check out Dwellus.com for yourself to find more ideas you can implement on your site. Great job, question. How do you use the short code to do the snippets/thumbnails in the tabbed area? Unfortunately, you won’t be able to get the same look with the regular dsIDXpress shortcode. Our shortcode will display a list of listing snippets as shown in the attached image. You can choose to display small or large photo thumbnails, and you should be able to alter the look of these thumbnails with CSS, but it looks like the team at Virtual Results “hacked” the code a bit to get their super customized listing snippets. We’re launching dsIDXpress Pro on Tuesday next week, which adds gallery view widgets very similar to Ryan’s site, and we’ll see if we can add new shortcode display options to our plugins as well. Thank you, we like to hack css as well. VR did a beautiful job on the site. Looking forward to the dsIDXpress Pro next week! Please see if you can add the shortcode display options, it would be really nice to use this on different pages. Love the horizontal display. Hello Robert! I wanted to see if in fact you could put together a blog post on how to customize the search modules using CSS? Thanks for all of your helpful information and tips! Yep, I’ll try to have something up on customizing CSS modules in August sometime. Are they just using Idxpress or Idx Search agent, too? This is using both products. Items 2 and 3 above are examples of IDXpress – and item 6, plus his main “Search” page load up SearchAgent. Hi Robert, is the mobile app and live chat an add on if you only use idxPressPro? The mobile search IS included with dsIDXpress Pro 🙂 If you’re not seeing it, or need help setting it up, let us know. Our live chat (AgentChat) is only included with SearchAgent — but it can be purchased separately… you’ll need to contact our sales dept for pricing as it changes based on number of users and account size. IDX is Internet Data Exchange. IDX real estate sites are useful for brokers. Thanks for sharing the ways for approaching real estate.